Polish rabbi of the eighteenth century; rabbi of Zamosz. He was the author of "Mishnat Ḥakamim" (Lemberg, 1792), an analytical work on the commandments, based on the ancient authorities and showing which laws were derived from the Pentateuch ("mi-dibre Torah") and which were added by the scribes ("mi-dibre soferim"). It is divided into two parts: "Yabin Shemu'ah," explaining the words of the ancients; and "Ẓofnat Pa'neaḥ," casuistic novellæ. The work is followed by an appendix entitled "Ma'alot ha-Middot" and composed of notes on the "Sefer ha-Madda'" of Maimonides. 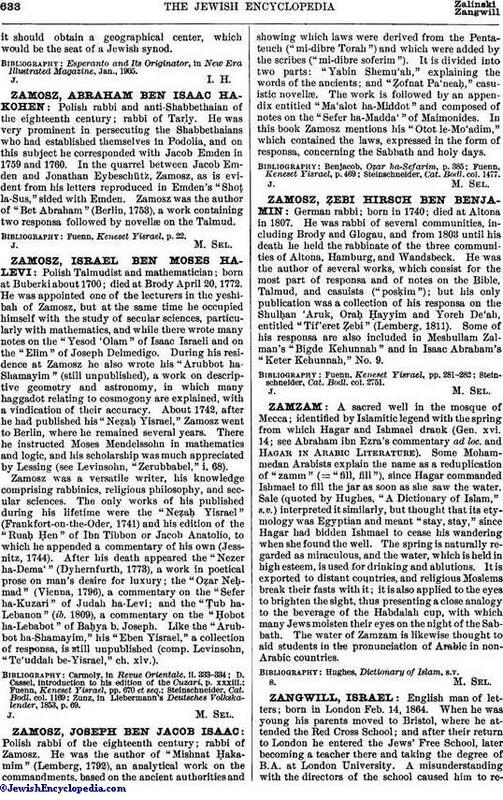 In this book Zamosz mentions his "Otot le-Mo'adim," which contained the laws, expressed in the form of responsa, concerning the Sabbath and holy days. Steinschneider, Cat. Bodl. col. 1477.